I Know That Look is a delicate pullover with a questionable name – there’s a story there. This design is worked bottom up and seamlessly in the round. 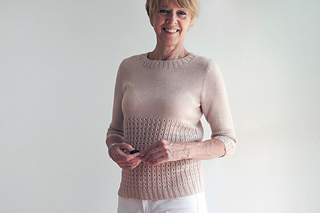 Shown in Quince & Co.’s Tern yarn, this silk wool blend knits up lightly with wonderful drape. Half-length sleeves are bottom up in the round as well, with short rows at their cap for smooth shaping and ease in setting in. Extending just below the elbow, I think of these as long-short sleeves – a perfect length for seasonal transitions. Enjoy! Shown in Tern yarn by Quince & Co. (75% American wool / 25% silk; 221 yards / 202 m per 50g skein); color – Cumulus #430; 5, 6, 6, 7, 8, 8, 9 skeins, or for comparable yarn, approximately 995, 1140, 1275, 1425, 1570, 1725, 1875 yards / 910, 1045, 1165, 1305, 1435, 1580, 1715 m.
Long-tail cast on, circular knitting, decreasing (skp, ssk, k2tog), increasing (m1L, m1R, yo), 3-needle bind off, short row shaping, setting in sleeve caps, stitch pick-up around neckline, and blocking. 10 page PDF includes pattern instructions, photographs, schematics, instructional links, and definitions for relevant abbreviations. You’ll find the story about its name on my blog post here.